Measurements: 32C / 20 / 32 in. - Curse Sworn: Artemis isn't aware of this fact yet, but Hestia and Zeus have, through their own Avatars, created an escape-proof betrothal contract that locks Artemis into a marriage arrangement with Hestia's son, Harry Potter. It isn't quite clear how she will react to the discovery when she finds out. - Divine Aura: Artemis exudes an aura of chaos that can be detected by pretty much anyone who enters her presence. It has a calming effect on animals and those more in tune with their animalistic nature, but an unnerving effect on those who are heavily focused on the development of human civilization. - Isolationistic: Wood elves, like Artemis, do not enjoy mingling with other races, to the point of being quite rude to guests. And this is when they are on their best behavior. This is largely on account of their utter hatred for what humans did to their cousins, the species now known as "House Elves." - Motivation: Thrills: Artemis lives for the thrill of the chase, and the exultation of the hunt. She won't be very happy if she has to give her lifestyle up when she gets married. - Mythic Weakness: Artemis suffers an additional degree of failure when trying to resist the effects of modern technology, but also causes such technology to suffer an additional degree of failure when it tries to resist her attacks and abilities. 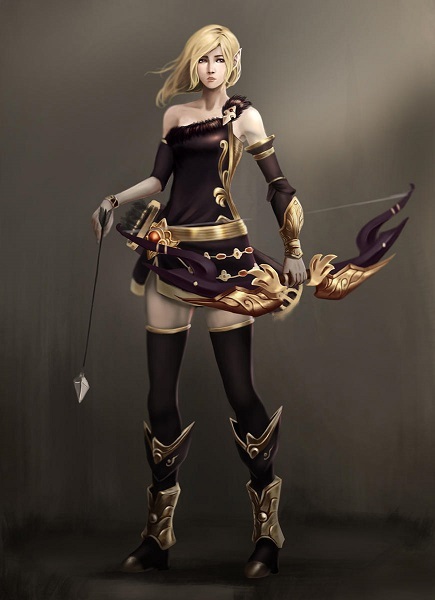 - Relationship: Artemis Miastina is the avatar of the Greek goddess of the same given name. 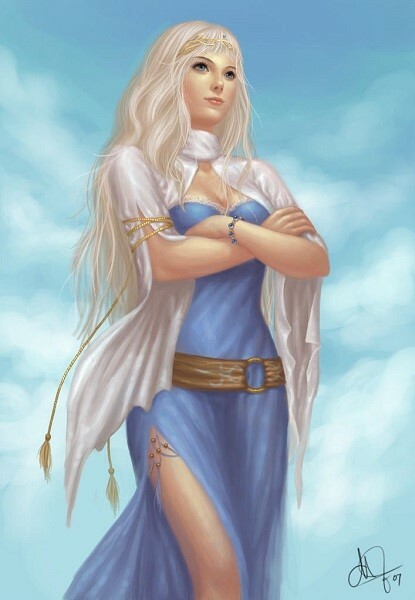 It can therefore be said that she is the sister to the Greek god Apollo, and the matron of pretty much all Nymphs, Veela and other woodland fey to have ever existed that happen to be predominantly female in terms of gender. She does not get along with either Dionysus or Pan. - Light or Gray aligned Harry for this fic. - Harry needs to be powerful in his own right. - When the story starts is up to the author, however it must start with Harry discovering his true identity as Zeus’s son. - Harry must have magic, as well as his godlike abilities. - As the son of Zeus, Harry must have power over lightning. - What form Ares takes in his bid to get to Harry in order to trick him, manipulate him, turn him, or just plain kill him, is up to the author. - Harry mustn’t allow anyone, not even those who raised him, to dictate how he uses his powers or achieves his destiny, whatever that destiny may end up ultimately being. - All pairing options are acceptable, except for those which involve another male. - Crossovers with other series, possibly including DC Comics, as that was the one this challenge was written with the intent to be crossed over with. - Harry is actually a full god, made mortal, but still the son of Zeus. - Once he has defeated Ares, Harry might seek to rebuild Olympus. - Other divine beings still live and are either friends or foes for Harry. - Other demigods exist on Earth and at Hogwarts. - Harry has a Shocker Lizard or some other Lightning-based familiar. - Harry being involved in a plural relationship, at least one of the members of which should be another demigod and/or goddess. - Harry not discovering his true identity until after Hogwarts. - Harry being dark or evil. - Harry having been born as a girl. - Harry turning down his heritage. - Diana of Themyscira existing in this story at all. - Harry being in a relationship with another male. - Destined for Greatness: One of the first things Harry heard upon returning to the Wizarding World, was that he was destined to do great things. Well, it turns out that he is the son of the former King of Olympus, and that it is his destiny to reclaim the throne of Olympus in his father's name. There really isn't a much greater destiny than that, that is for sure! - Enemies: There are still those who would like to have a return to the dark times when Voldemort was in power over Wizarding Britain. These individuals rightfully blame Harry as the source of their 'misfortune' and seek always to do away with the shining beacon of the Light. That, combined with the fact that Ares is now plotting ways to do away with Harry, will make for a life that is always interesting for our protagonist. 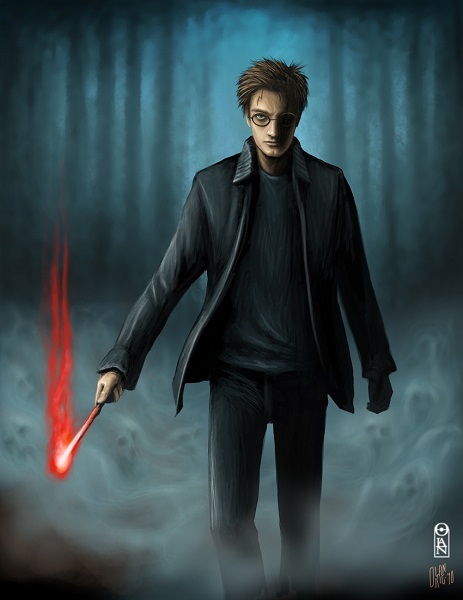 - Fame: Harry is also quite famous for the act of defeating the Dark Lord Voldemort, just as he is someone who can expect lots of enemies for doing the same thing. This means he can expect a lot of media attention when he does anything even remotely heroic, at least from the Wizarding Media, and to be hounded by fangirls and fanboys. - Relationship: Harry retains a firm loyalty to past friends, such as Hermione Granger and most of the Weasley's, although certain members of that family have proven themselves disloyal in the past year. Build Comments: Assume the Marauder's Map is in the Trophy Room at 12 Grimmauld Place, and Sirius' motorcycle is in the garage. Measurements: 33D / 25 / 34 in. 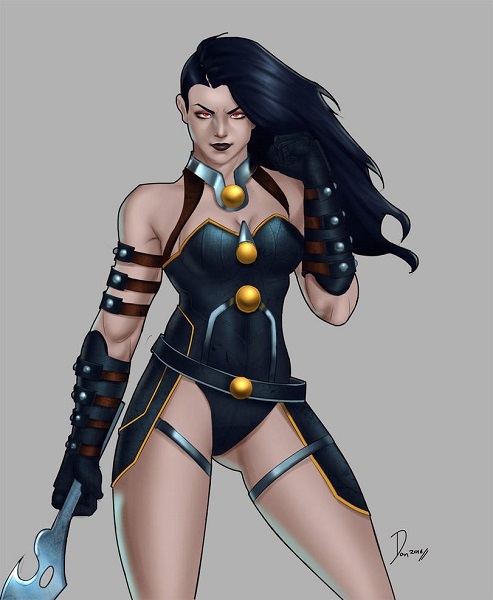 - Enemy: Athena is historically the primary rival to the God known as Ares, the two do not get along, and she would quite happily run him through with one of her spears if she thought it would do any good. - Fame: Athena is one of the most famous deities in the history of the world, and with that comes a certain measure of difficulty, as she can easily be recognized due to the number of icons that still exist even to this day that have a more or less accurate depiction of her appearance. - Motivation: Justice: Athena plans on doing everything in her power to help Harry with his mission to take Olympus back from Ares, no matter what it is that she has to do. 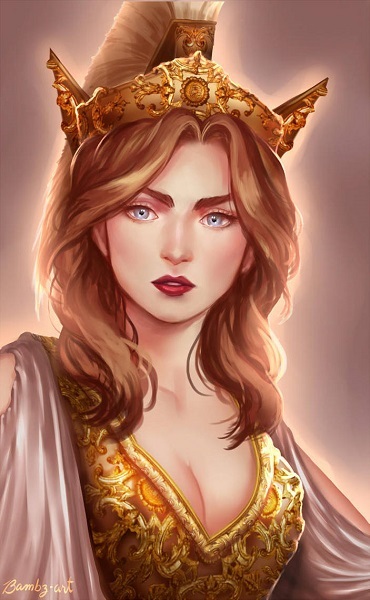 - Relationship: Athena is technically the deity with the closest level of kinship to Harry since like him, she also lacked a deific mother, having been born exclusively through Zeus's divine power. In a way, this sort of makes her Harry's twin sister. Last edited by DalkonCledwin on Tue Feb 12, 2019 1:35 am, edited 2 times in total. Measurements: 36D / 22 / 35 in. - Motivation: Responsibility: Laurel feels a strong sense of responsibility to use her powers for the benefit of all. - Power Loss: When Laurel is exposed to the light of a red sun, like that which Krypton orbited, she loses all powers with the "Kryptonian" descriptor. Other effects which drain or interfere with the energies of a yellow sun, like that which Earth orbits, can likewise deprive her of his Kryptonian powers. - Relationships: Laurel's closest relationships in life include her mother, Martha Kent, and friends and co-workers Jane Olsen, Penny White and Clarence Grant. She is also quite close with Konnor Kent (otherwise known as Kon In-Ze). 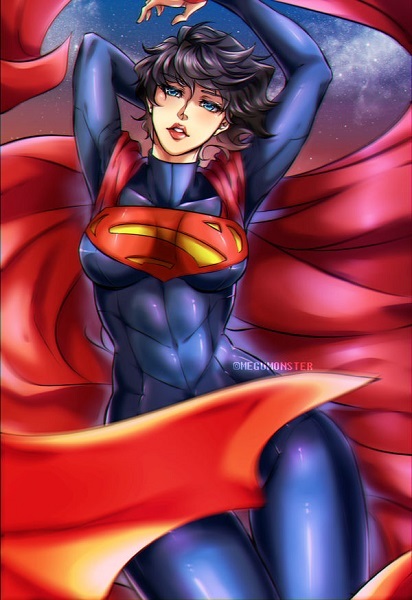 - Secret Identity: Laurel Kent, mild-mannered reporter for the Daily Planet is in reality Superwoman, the heroic lady in blue! - Weakness: Laurel is vulnerable to magic. Her Toughness is not Impervious against magical attacks. She is also vulnerable to the effects of Kryptonite. Build Comments: This stat block, should tell you what the situation is with the actual DC characters. The situation won't affect the characters from Potterverse or the characters who aren't actually from Earth-proper, but it does affect the ones who were born on Earth and are normally a part of DC comics who aren't deities or something like that. Harry is a noted exception, since he is technically both a DC character and a Potterverse character. Measurements: 34C / 24 / 36 in. - Enemies: The people of Apokalips, Usyn included, are locked in a seemingly eternal conflict with the citizens of New Genesis. The citizens of New Genesis include Usyn's very own daughter, Artemis of the New Gods. Usyn's biggest enemy is Queen Sophia, the High Mother of New Genesis. - Motivation: Justice: Usyn is truly working to end the atrocities against her people that New Genesis is causing. The problem is she is walking a dangerous line between being an avenging angel, and being an outright villain herself. - Obsession: With finding the Anti-Life Equation so that she can succeed in stopping the ceaseless war that New Genesis is waging against her largely helpless world. She can justify any crime she has to commit in her quest by looking at the casualty list of the pogrom New Genesis is executing each morning. Build Comments: Oh dear me... something's a bit off in the heavens... Her date of birth is important, by the way. Measurements: 32C / 22 / 30 in. - Hatred: Luna absolutely despises Nargles (aka Bullies), but rarely ever does anything to prevent them from doing mean things to her. - Motivation: Responsibility: Like many of the other members of Dumbledore's Army, Luna was inspired by Harry to make a difference in the world that benefits it for the "Greater Good." - Obsession: "Say! I like green pudding and tapioca! I do! I like them, Harry-I-am! And I would eat them in a boat. And I would eat them with a goat..." Yeah, okay we get the point. Luna is obsessed with pudding. - Quirk: In her younger years, Luna believed in many things which definitely do not exist anywhere on Earth. While she has largely outgrown the belief that she will ever find those things on Earth, she can still be said to hold firm to the belief that the exist "somewhere out there." - Rivalry: Luna is the up and coming star with the Quibbler, and as such tends to have a rather significant rivalry with the new up and coming star for the Daily Prophet, one Parvati Patil. Build Comments: Incidentally, Luna actually knows a language that neither Laurel Kent or Helena Wayne bothered with trying to learn. Luna knows how to speak Klingon. 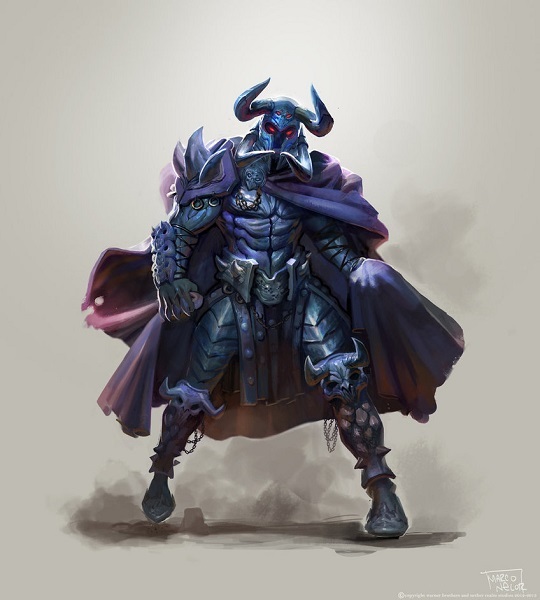 - Enemies: Ares has had millennia to make powerful enemies, of which he has many. - Fame: Ares is known as the Olympian God of War. He is also known by his Roman name: Mars. - Relationships: Ares is the son of Zeus and Hera, whom he murdered in his conquest of Olympus. He is romantically involved with his half-sister Aphrodite, and his children are Deimos, Phobos, and Eros. - Reputation: Ares delights in combat and strife. He is never more happy than when in the middle of a battlefield. Build Comments: If the heroes want an even shot at beating Ares, then the bare minimum group composition they can use when facing him is as follows: Harry, Luna and any single one of the other girls that happen to be listed between Harry and Luna. Measurements: 32D / 23 / 35 in. - Obsession: Sophia seeks to unite the races of universe under a single banner of peace and harmony. Any who defy her are seen as unclean and unworthy of her paradise. This results in her sending her armies to their world so as to systematically wipe them out, as she is attempting to do with Apokalips. - Self-Righteous: Sophia believes she is the most benevolent being in the universe. Everything she does is for the “greater good;” including the extermination of entire planets that refuse her blessing. Measurements: 34C / 24 / 32 in. - Enemy: Artemis firmly believes that Usyn is her enemy and will do everything in her power to see both Usyn, and any of her allies, put into a premature grave as swiftly as possible. 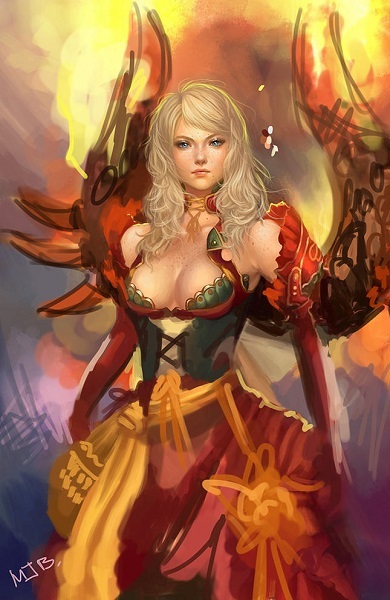 - Relationship: Artemis is the biological daughter of Queen Usyn of Apokalips, but while still an infant, she was abducted by invaders and brought to New Genesis where she has since been raised as the loyal 'daughter' of Queen Sophia. - Temper: Artemis' personality is something of a double edged sword. Sometimes the shame, rage and pain she feels over her true parentage gets to be too much for her and she lashes out. In those moments, enemies, bystanders and friends alike may become the targets of her fury. - Starts after Dumbles reveals the prophecy to Harry. - Crossover with Final Fantasy VII, with Harry using the RoR to get to Gaia. - As is obvious, the world of Final Fantasy is locked in a long term conflict between Shinra Inc. and various other factions. - Harry must somehow get dragged into one of these conflicts. - Harry must be paired with someone from that world. - Dumbledore must make at least one attempt to bring Harry back to Potterverse before he is ready to return. - Harry’s parents are somehow connected to the world he has traveled to. - Sirius and Harry’s parents being reborn on the world of Gaia, or else somehow being there when Harry arrives. - Dumbledore succeeding in convincing Harry to return to Potterverse before he is ready. - Harry being paired with a male character. - For the Disc 1 Team builds, I am going to try my best to keep everyone within the 150 point budget that is normally requested for Power Level 10 characters when they first start off. And yes, I envision the characters as being Power Level 10 at the start of disc one, however I only really see them going as high as Power Level 12 at the end of Disc 4, which is about where most people put Batman. These characters are strong, but not world shatteringly so. - These characters will be built with abilities that did not appear in the game proper, because they are meant to be fun to play as Mutants & Masterminds characters rather than straight translations of the game characters, which wouldn't be anywhere near as fun. - Enemies will be built with the degree of challenge that I expect them to represent, and while I won't be building an entire monster manual here, I will build stat blocks for the boss battles at the very least, as those are important milestones. Oh! I forgot to mention... Summons in this setting are going to be handled as Power Stunts, rather than as actual abilities that the characters have in their stat blocks. I don't want the characters spamming those things, and they really shouldn't be if you stop and think about what a summon represents in Final Fantasy lore. - Enemy: The Dark Lord Voldemort does not for even a single second, believe that Harry has simply disappeared due to being afraid of him and an unwillingness to fight. He at least is aware that Harry has gone somewhere to learn how to fight him, and is trying to figure out where so he can preemptively kill Harry. - Motivation: Responsibility: The deaths of Cedric Diggory and Sirius Black have had a profound effect on Harry. He does not believe he is adaquetly prepared to defeat the Dark Lord Voldemort as he stands, and has gone in search of the means by which he might develop the abilities necessary to enable him to do such a thing, so as to honor the sacrifices of those who went to their graves long before their time. - Relationship: Harry has recently discovered that the Witches and Wizards of his reality, are basically exiles from the world he now finds himself in. That they are one and the same with the people who on this new world were called the Cetra. This, along with a curious girl with earily familiar green eyes, has left him very curious about just who Aerith Gainsborough really is. - Reputation: As of recently, Harry is known as "The Boy Who Ran Away" among the Wizarding Community of Great Britain. Build Comments: According to the Final Fantasy wikia, the phrase "Spirit Energy" is synonymous with the word "Lifestream." Editing Note: I changed what Minerva's Blessing does, because I just realized I can't use what I had originally designed it to do and stay within caps. Last edited by DalkonCledwin on Wed Feb 13, 2019 9:56 am, edited 1 time in total. - Hunted: Shinra is trying rather hard, though also rather inefficiently, to capture Aerith for further research into just what it is that makes a Cetra different from an ordinary human. She mostly finds their efforts to be a form of entertainment, which may one day come back to bite her in her cute caboose. 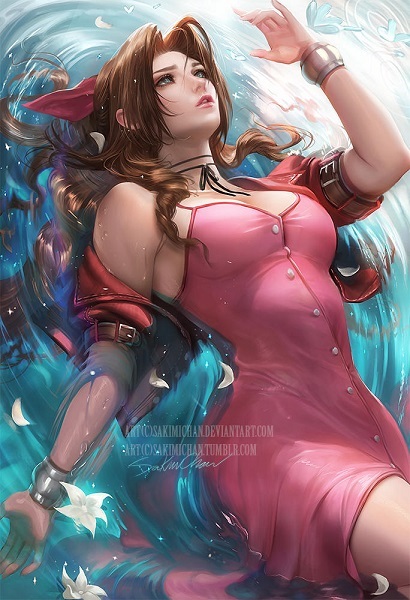 - Motivation: Doing Good: Aerith sort of encapsulates the phrase "All-Loving Heroine" as she is very kind and generous and unless given sufficient reason not to be, is usually rather pacifistic in her behavior. - Mythic Weakness: Sephiroth's sword will definitely kill Aerith for realsies if he manages to impale her with it. - Relationship: Aerith is just as curious about the odd similarity in their eye color as Harry is. She can't quite figure out what it means, and the planet doesn't seem intereted in explaining it to her. Build Comments: You'll likely have noticed that Aerith isn't very useful in a combat situation. 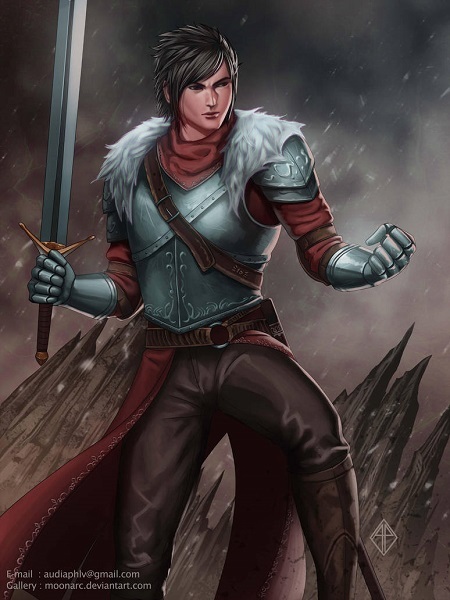 Her main use to a party is taking advantage of the Set-Up and Teamwork advantages to help her teammates be just that much more effective at what they are doing in a social situation, and though it will happen less often, in a combat situation as well. Those two advantages combined with the Inspire advantage and her Belief in Others power, makes it so that her best use is in the form of the phrase "Team Buffer." As a side note, I am abstaining from trying to figure out the measurements of the girls in Final Fantasy 7 for the simple reason that I haven't got any desire to try and guess what Tifa's measurements might actually be. 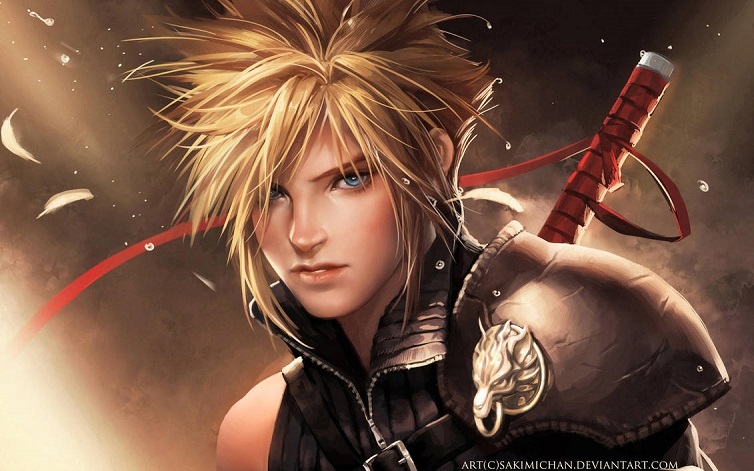 - Curse Sworn: Whether he likes it or not, or even whether he realizes it or not, Cloud is part of the Reunion of Jenova, and thus is capable of being manipulated by both Jenova and Sephiroth in ways that could both hurt his teammates as well as Cloud himself. - Enemy: Cloud does not like Sephiroth, though he doesn't really understand why he dislikes Sephiroth due to the gaps in his memory. - Identity Crisis: Cloud suffers from intermitant amnesia regarding his own life, and also flashback memories to the life and times of Zack Fair due to the latter individual having dictated his life story to Cloud while Cloud was suffering from advanced stages of Mako Poisoning. This often leaves Cloud questioning just who he really is, whether he is Cloud or Zack. - Motivation: Greed: "You are planning to pay me for this one, right Barret?" - Relationship: Cloud was childhood friends with Tifa Lockhart, and though he barely remembers it, has promised to save her if she is ever in need of a hero. Builder's Notes: I don't normally give guys 2 ranks of the Attractive advantage, but I'm afraid of how much hate mail I would have gotten if I didn't give both Sephiroth and Cloud such a rating. For reference, 2 ranks of Attractive is the absolute highest ranking you can get in that advantage in Mutants and Masterminds, so I can't actually go any higher than that. - Fame: Tifa is the owner of the bar known as 7th Heaven and is one, of if not the, most beautiful women in Midgar. This has won her considerable fame, and it is known that Don Corneo wishes to add her to his collection. 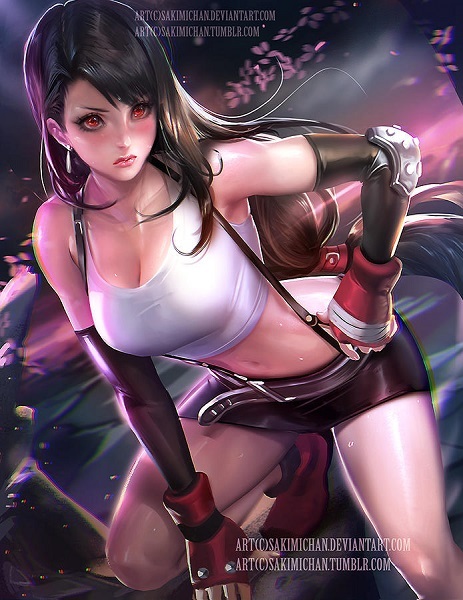 - Motivation: Justice: Tifa is wholly committed to the cause that Avalanche fights for, mostly because of the pain and suffering she experienced in Nibelheim at the hands of Sephiroth. - Relationship: Tifa is the childhood friend of Cloud Strife, and the primary contender for his romantic interest since Aerith is more focused on the mystery that is Harry Potter. - Secret: Tifa is fully aware that Cloud was never in SOLDIER like he claims he was, but is also not currently inclined to admit that fact to anyone. Builder's Notation: I should probably clarify. I am, for the sake of convenience, ruling that Basic and English are effectively the same language.